As the scent of incense wafts unseen to all corners of a shrine, so do the spirit realms overlap invisibly with our own. The Phoenix mediate between both worlds, appealing to the very soul of the lands. Mountains collapse at their whispered requests, dry rivers are convinced to flow again, plagues are banished, restless ghosts are returned to slumber, and crops flourish in previously barren wastelands. Nevertheless, the Phoenix understand that even the purest wish can have unintended and destructive consequences if the elements are brought out of balance. Although others consider the Phoenix too hesitant in their entreaties to the kami, few are foolhardy enough to test the Phoenix’s dedication to peace and harmony. Fantasy Flight Games is proud to present "Risen from the Flames" by Robert Denton III, a new piece of fiction set in the world of Legend of the Five Rings! "Risen from the Flames" focuses on the mystic Phoenix Clan and can be downloaded here (3.1 mb). 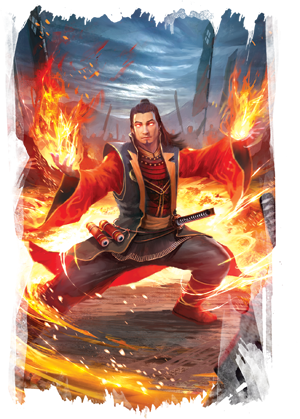 Join us next week as we continue spotlighting the Way of the Phoenix with an in-depth look at their gameplay mechanics in Legend of the Five Rings: The Card Game Be sure to check the Fantasy Flight Games website every other week for new Legend of the Five Rings fiction! Study the elements and purchase Legend of the Five Rings: The Card Game (L5C01) at Gen Con 2017 or from your local retailer in the fourth quarter of 2017.